If you loved The Third Twin and One of Us Is Lying and binge-watched Thirteen Reasons Why, get ready for a heart-wrenching psychological thriller about a girl who knows her twin sister better than anyone . . . or does she? 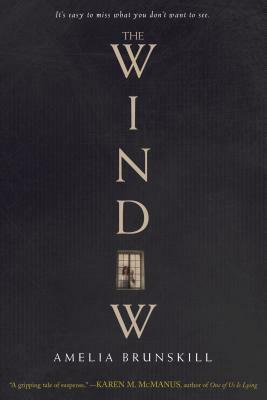 Taut and atmospheric, The Window will keep you guessing until the end. Anna is everything her identical twin is not. Outgoing and athletic, she is the opposite of quiet introvert Jess. The same on the outside, yet so completely different inside—it's hard to believe the girls are sisters, let alone twins. But they are. And they tell each other everything. Amelia Brunskill lives in Chicago with her husband and her dog, Max the corgi. She is a librarian who drinks excessive amounts of tea and does not always return her books on time. The Window is her first novel. You can visit Amelia online at ameliabrunskill.com and on Twitter at @ameliab.